Continued: Get started with the Guaranteed IQ course today! Are YOU Ready to Begin Your IQ-Enhancing Adventure? Here's How Much It Costs to Increase Your IQ to 140 or MORE. If the Guaranteed IQ course is everything I say it is, how much would you expect to pay for it? $300.00? $500.00? Even $1,000.00? That's what most other similar programs are priced at - and many of them are produced by people who don't provide a fraction of the proven intelligence-boosting materials this program provides. The good news is, your investment to receive the Guaranteed IQ course is a one-time-only $119.95 (approx [PRICE-USD119.95-INGBP]), with NO other payments NOW or EVER. Health Worth $3.99 a Day to You? That's right. Just $3.99 a day for you to benefit from proven and practical techniques you can use to boosting your intelligence quickly, easily and (almost) effortlessly. Use Guaranteed IQ risk-free for the next 30 days. If during that time you aren't delighted with it for any reason (or even no reason at all), then write to us to cancel your order, return the product, and I'll send you a full refund of your investment. You can even keep all of the Bonus Gifts (see below) you receive as a small 'Thank you!' for trying us out. No questions asked. No small print. That's how absolutely certain I am you'll be delighted with Guaranteed IQ. And Receive Two Bonus Gifts Worth $147.00! And the Guaranteed IQ package still doesn't stop there. Order your copy today, and you'll also receive a downloadable companion toolkit. This 30-page PDF guide serves as a handy side-kick to the main audio CDs - so you'll never be left without a handy reminder of the powerful techniques covered on the audio course. Plus, you'll also receive a special lateral thinking puzzle book from best-selling author, Nick Daws. Test out your IQ improvements by seeing if you can solve the riddle! 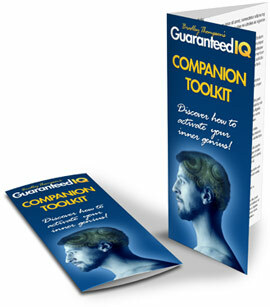 When you order the Guaranteed IQ course today, you'll also receive an additional Downloadable Companion Toolkit. As well as reminders of all of the techniques covered in the two main audio lessons (the core of your Guaranteed IQ course) it includes checklists, exercises, quizzes and additional resources for broadening your knowledge and polishing your skills. Conventional wisdom (perhaps developed because of the school system and the media) says that learning is somehow 'boring', and boosting your IQ and intelligence is somehow 'hard'. The good news is, nothing could be further from the truth. 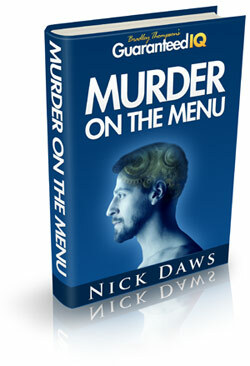 Especially when it comes to your IQ benefiting from this lateral thinking short story -- titled Murder on the Menu, written by leading author Nick Daws. The central character in this 'Whodunnit Thriller with an IQ twist' is police investigator Jake Strogani. During this puzzle, you put yourself in Jake's shoes as he conducts his investigation, and see if -- by applying your lateral thinking skills -- you can crack the case. Not only is it great fun to pit your wits against a 'criminal mastermind', it's also a fantastic complementary learning tool which fits perfectly with the rest of your Guaranteed IQ course. In short, it's an ideal exercise in logical thinking, a great 'IQ Workout' and an easy way to build on the Intelligence-boosting progress you've already made in the main program. So, are you ready to begin the adventure - and discover the Guaranteed IQ course for yourself - starting today? Remember, you'll receive BOTH audio CDs shipped straight to your door, plus we'll e-mail you download links for your Companion Toolkit and the bonus murder puzzle book. You'll uncover techniques for drastically improving your IQ - just by making simple lifestyle changes you'll hardly notice. And you'll learn about a handful of super-sonic methods that science has shown to dramatically improve intelligence - AND you'll be guided through them, AS YOU LISTEN. Not only that, it's all totally risk-free too. No other course offers so much for so little. Are you ready to gain access to the entire Guaranteed IQ course - with all of its bonuses - all shipped straight to your door? STOP PRESS: Now includes FREE international shipping and handling! Total Cost: $119.95. Includes FREE international shipping. (Prefer to pay by PayPal? Please click here. Or, Choice number #2: Grab your copy of the Guaranteed IQ course, use the information in it, unleash your inner genius and enjoy the life you deserve for the rest of your life. I'd like to urge you to choose the risk-free choice #2 - and just see how the Guaranteed IQ course can change your life. You'll be amazed at how boosting your IQ will not only increase your intelligence - but also boost your wealth, improve your physical health, help you to master your emotions, and will ensure you enjoy a happy, healthy and productive life. Let me prove to you - beyond any doubt - that I can improve your IQ. Remember: The instant you make a decision, you create your future in advance. All you have to do is try it. The results will amaze you. I guarantee it. 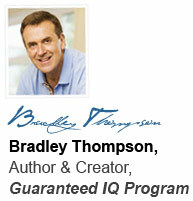 Click Here To Reserve the Guaranteed IQ Course!